Yesterday we reported on remarks made by Family Research Council's Tony Perkins, reacting to a Colorado baker who was recently told he must abide by the state's anti-discrimination statutes and bake wedding cakes for gay couples. Perkins suggested that an anti-Christian Holocaust was coming, warning that gays would soon start "rolling out the boxcars" as the Nazis did to Jews. The National Director of the Anti-Defamation League was not impressed by Perkins's rhetoric. 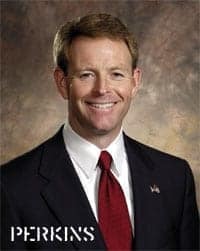 Tony Perkins’ invocation of the Holocaust in his statement referring to a judge’s finding that a baker unlawfully discriminated against gay customers is offensive and inappropriate. There is no comparison between contemporary American political issues and the actions of Hitler’s regime during the Holocaust. Such inappropriate analogies only serve to trivialize the Holocaust and are deeply offensive to Jews and other survivors, as well as those Americans who fought valiantly against the Nazis in World War II. We urge Perkins to apologize and to refrain from using Holocaust imagery to make his point. But what can one really expect from a hate group leader?